Following on from their excellent debut of 2008, the Paris-based Arkan are back with a new album, and by some strange magic they’ve managed to do it again, building on their interesting and original mixture of influences to create a more than worthy follow-up. Those who have heard Hilal will know what to expect, a mixture of progressive melodic death metal and Arabic ethnic sounds fused together wonderfully well. Arkan don’t make a storm of riffage so much as construct an otherworldly atmosphere for you to revel in, taking you right back to their musical and cultural roots in Algeria and Morocco. It’s as much a journey as an album. From the very beginning of opening track Origins, hand percussion mixing with technical Middle-Eastern flavoured riffage in an epic build-up, you’re thrust into Arkan’s world, and the band constantly keep you on the edge of your seat. Everything from skilful time-changes to well-placed female vocals are thrown into the mix, melodies and rhythms constructed and cast down, resulting in the sort of album that is at once modern and timeless. The proggy opening to Inner Slaves is a great example, female wailing and off-kilter percussion mixing with distorted male vocals and jagged-edged riffing. Although there’s little outside of this formula that will surprise, it doesn’t stop the album being highly enjoyable. The band never seem content to use one riff where several will do, using complex melodies and drum patterns without ever losing their accessibility. Moments like the vocal hook in Blind Devotion are maddeningly catchy, whilst the epic loveliness that is Sweet Opium’s lazy meander is movie soundtrack material. One obvious comparison to make is to Israeli Proggists Orphaned Land, and as if anticipating that frontman Kobi Farhi is a guest vocalist on Deus Vult, his clean singing in a duet with Florent Jannier’s harsh Opeth-ic growls. Arkan sound more like them here than they did on Hilal, having a folky prog feel to the likes of Call From Within that is quite different from the resounding death metal influences elsewhere. You could almost accuse Arkan of having toned it down a bit, moments like the aforementioned Inner Slaves approaching female-fronted gothic metal standard territory were it not for the furiously growled interruptions and ethnic elements. Female vocalist Sarah Layssac has a definite similarity to Cristina Scabbia of Lacuna Coil in her airy ‘aaa-aaah’ing quality, and there does seem to be more acoustic moments here than before. 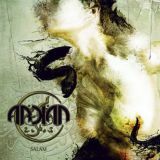 Still, the number of metal bands with genuinely authentic Arabian elements can be counted on one hand, and Arkan’s second album proves they have a niche of their own in the Metal world. Recommended.